Melbourne, Australia, the home of four seasons in a day and capital of the diverse melting pot of dreams was the perfect location for Alin to embrace and embark on his journey. The mélange of requests for gowns and dresses from family friends served as a catalyst to growing his range of artistry. Building on early explorations, his studies in RMIT University gave him the firm foundation of knowledge and craftsmanship which served to streamline his aspirant and decadent designs. Alin’s debonair relationship with textiles then grew over a decade in the industry, culminating in a rich expression of light, of flight, of shining brilliance that becomes the focal point of any memorable occasion. 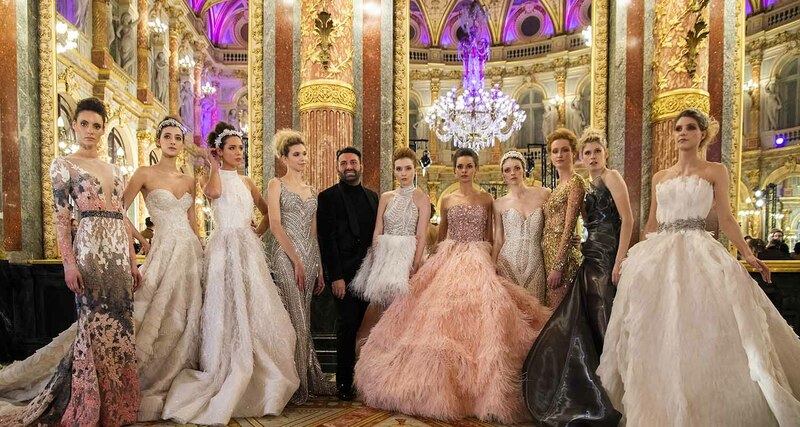 And no client demands this more than the brides that seek Alin Le’Kal’s prowess with extravagant trains and intricate finishings, serving to illuminate their inner beauty and enhance their feminine silhouette with his signature flourish. This is mirrored throughout his dalliance with captivating crystals, with angelic feathers and radiant light sewn through each piece presented this year in the collection ‘Reflected Elements’. Contrary to the quick and tawdry of today, Le’Kal is more than just a moment, Le’Kal is a memory steeped in elegance and confidence.